If you're wondering what I'm up to today, scraping paint off my cuticles, arms, legs, etc. is likely a safe guess. Over the last week I've painted both bathrooms, including trim (not my favorite part of the job, by the way). Sadly, I still have to sand and paint 5 doors. Will it EVER end?! Speaking of doors, remember my inspiration for the Master bath shower panel? Just in case you missed the first week of the ORC, this picture will catch ya up to speed. Nice, right? I literally designed the entire bathroom around this idea, thinking it'd be fairly easy to come by since they're all over Pinterest...uh, wrong! Steel-framed doors, come on Texas, get with the trend! 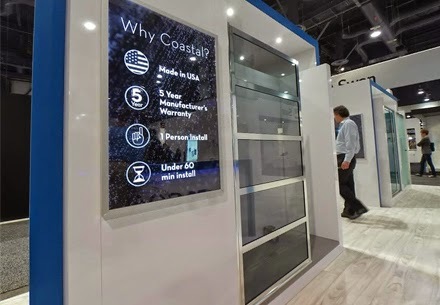 After searching all around and even conspiring with a few glass companies and a welding company about how we could create a DIY version, I finally found Coastal Shower Doors. They just launched the design below at market in Vegas. Picture it with a dark frame, then picture it in my bathroom! The good news is, it's ordered. The bad news is, it won't be here in time for next week's reveal. So I guess I'm admitting failure now and just getting it out of the way. ha! I'm loving our new vanity! Now, the million dollar question is what to do about mirrors? Let me give you a little insight into my decision-making process...pull anything remotely close to the finish you're considering and throw it up there to get a feel, hence the random assortment of pictures, tape, etc. Hmmm, the jury's still out. I'm having sizing/spacing issues and have to decide between the lesser of two evils. Issues? Yes, that's my fiddle leaf fig trying to take a bath! Or, maybe it's just trying to show off the newly installed and freshly painted window trim, who knows? I never knew I could get so excited about toilets, but when these babies got installed I may have done a little happy dance. BOTH downstairs bathrooms now have functioning toilets. Woo hoo! No more climbing stairs in the middle of the night. Happiness! The Guest bathroom is really coming together. I'm happy to say at least one of the bathrooms will be 100% complete for next week's reveal. The tile and finishes in this room are a little out of the ordinary. I laid awake countless hours wondering if I was creating a visual nightmare, but I have to say I'm pretty pleased with the way things are coming together. Oh, that utility cart...such a tease! 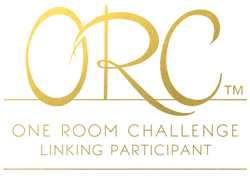 Don't forget to visit Linda at Calling it Home to see the other ORC participants. So much creativity going on these days! Love it. You are so brave for tackling two bathrooms and I love all your progress. That shower door is going to look stunning!! Wow, Dana. You'll have one (two) chic bathrooms for sure! 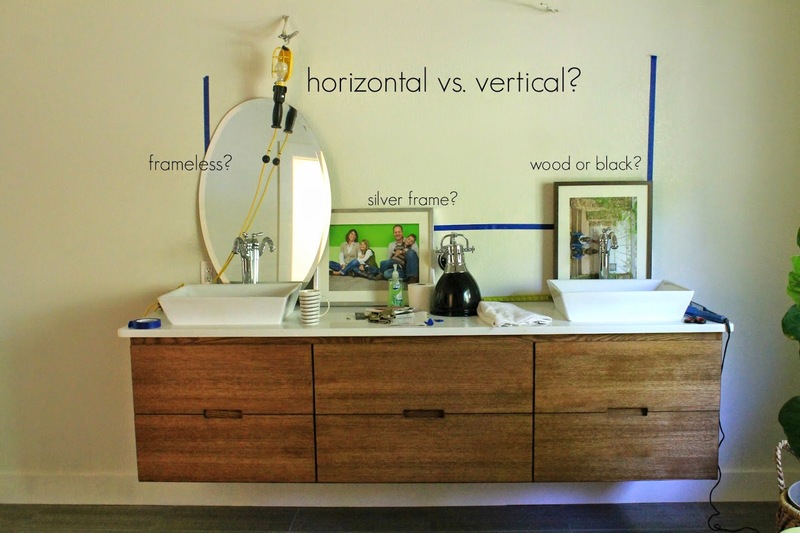 I like the contrast of the frameless mirror, but it will be fun to see what you choose. My bathroom has the standard rectangular mirror pane, but trimmed out with a beveled mirror frame. It's simple but pretty, might be an option to consider! 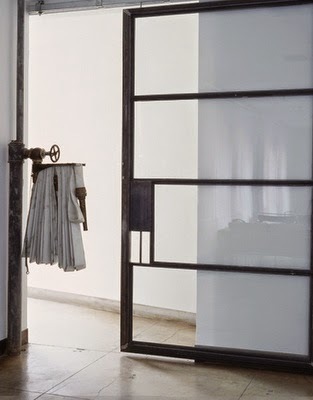 I've had my eye on a Coastal Shower steel framed door for our master bath remodel. I can't wait to see how yours turns out! That door will be SO worth the wait, though! I can't believe you took on two bathrooms and have completely rocked them both. Amazing job- I can't wait for the reveal! So much goodness going on over here!! LOVE your vanity and so happy you found your shower door, that combo is going to be KILLER!! And, your tile and pattern in guest bath is gorgeous, the cart is way too clever! You've worked SO hard on this, can't wait girl! I still can't believe you took on two bathrooms for this. I'm doing one tiny powder room and feel overwhelmed. Things are looking great. And that shower door will be so fun once you get it (even if not in time for the reveal). Wow Dana, everything is looking so good! And while the door might not get there in time, it sure looks like it will be worth the wait. Can't wait to see more next week! Um....committing to 2 bathrooms? I would say no shower door or not, you are far from a failure! You are brave! 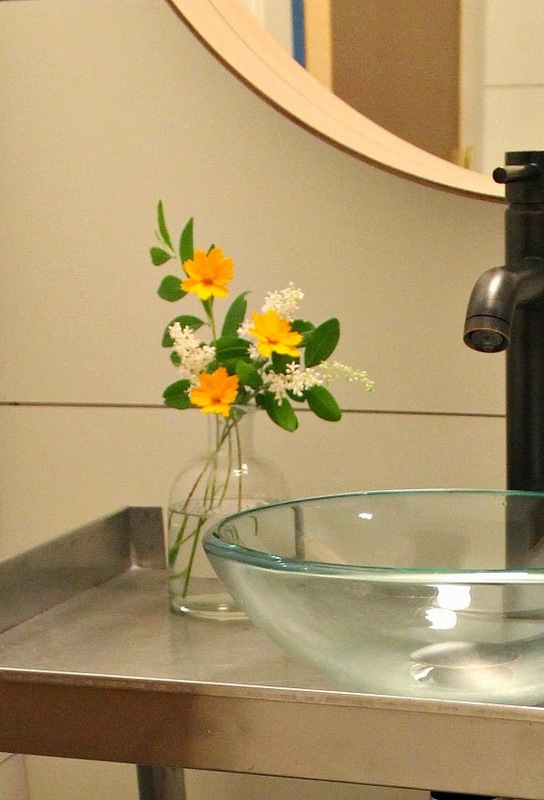 I love, love, love the vanity and your design process is just like mine. Good luck in the last week! That vanity ... wow! Totally amazing. I hear you on the glass wine won't be in either. But in the end it will be worth it - that door will look fantastic!! Can't wait to see the end!! With or without the door, your bathroom is looking divine already Dana! Great post! Very excited to be a part of it. Please let us know how the finished product turns out and that we've exceeded your expectations. Everything looks fantastic, with or without the door! You are hilarious, your fig tree does look like it wants to take a dip in the bath!Ha! Looking forward to seeing the final reveal! Good Luck! Dana I love your unconventional choices, your bathrooms are looking amazing!! Can't wait for the final reveals on Thursday and your future door is going to be fabulous too. Thanks for this amazing and beautiful things. I also get some new content from it, a grateful debt is to share your data. AutoShopUA provides an auto auction service in the USA. We are an expert in procurement and import the American auction. We also offer auction car loans. everything is looking so good! thanks for sharing with us.